Class 8 sample paper & practice questions for International Reasoning & Aptitude Olympiad (iRAO) level 1 are given below. Syllabus for level 1 is also mentioned for these exams. You can refer these sample paper & quiz for preparing for the exam. In a mother-daughter code language, one clap means "I need a glass of milk". Simultaneous Two claps mean "I need chips". 2 friends of mine came home and I clapped two times simultaneously and one half claps. What am I asking for? c) A glass of milk and bowl of chips. The difference of two numbers is 1365. On dividing the larger number by the smaller, we get 6 as quotient and the 15 as remainder. What is the smaller number? 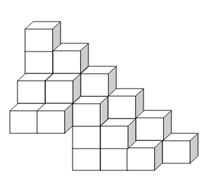 How many blocks would you need to build the following figure? Find the coefficient of t^3 in 6t (9t + 7t + 8t^2 + 3t^3). If JKML=QPNO. Then what does ABDC=? Point with coordinates (7, 5) is moved 3 units to West and then 3 units in South, find the coordinates of the point after the point is moved? If North=East; East=South; South=West; West=North then based on the equation answer the following question. Swati is driving a car in the North direction. She drives for 3 km and take a sharp left turn and drives for 4 more km. In which direction is she heading? Also find out the shortest distance between starting and end point. 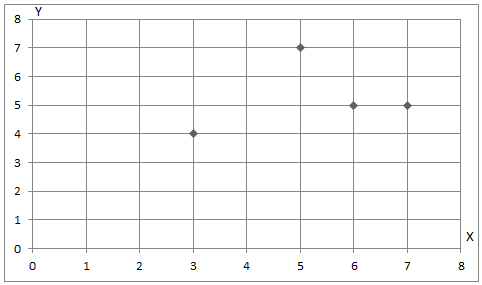 Select the figure which satisfies the same conditions of placement of the dots as in Figure-X.